"We should be listening to you, not lecturing to you!" 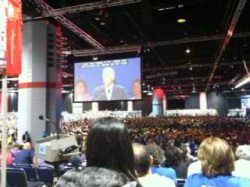 VP Joe Biden told thousands of us cheering educators Sunday at NEA 90th RA. "We should be embracing you, not pushing you aside! You are not the problem!" he said. The Secret Service clearance took some delegates 3 hrs. to reach the convention floor, however, the wait was well worth it. 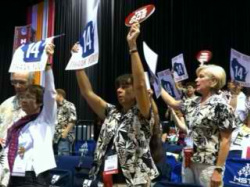 In addition to making decisions about new business, delegates re-elected NEA President Dennis Van Roekel & VP Lily Eskelsen to 3 yr. terms. We have raised $10,800.22 for NEA Fund which puts us #23 in the nation in donations per member. 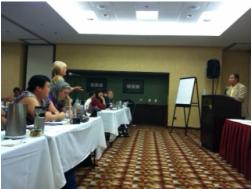 We are at the annual NEA RA, the world's largest democratic deliberative body. As one of the 11,000 educators at McCormick Place in Chicago, we were overwhelmed with the music, pageantry, affirmation of the education profession & passionate speakers! Business was conducted by voting on Standing Rules, By-laws, Admendments & New Business Items. We attended NEA's 1st annual Day of Learning. The general session opened with a panel discussion, Improving Schools Through Collaboration moderated by TV personality, Tavis Smiley. This was a provocative, challenging and informative session about public education. 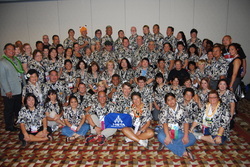 Diane Abraham & Diane Mokuau attended the HSTA caucus for the National Education Representative Assembly (NEA RA) in Chicago today. Highlights were: being greeted by President Dennis Van Roekel, listening to NEA candidates' speeches, HSTA Negotations update & Diane Abraham's speaking on how Molokai Chapter is getting our teachers' stories out to the community.